Live video streaming events company - Capturing your events. Captivating your audience. Switch New Media film are a live webcasting and film production company. We film, record and simultaneously live video stream conferences and events throughout the UK, Ireland and Europe. We offer live multi-camera TV quality coverage of your conference, training workshop or event and deliver it live online to your fully branded website. Provide all year round 'video archive' access to delegates, speakers and sponsors - 365 days of the year. live webcast from The Royal Institute of Great Britain, London. FSB Conference - Streamed live from One Great George Street, London. The British Council annual lecture with Michael D. Higgins, President of Ireland filmed and streamed live to a global audience as part of The 50th Ulster Bank Belfast Festival at Queen's University Belfast. Digital DNA Conference - Live Webcast from Titanic Belfast. The IF Campaign Launch live streamed from Somerset House London in January 2013. Watch the video highlights from Somerset House here. This event was filmed & streamed live on behalf of the Enough Food For Everyone If - a joint campaign delivered by over 100 UK charities. The Trust Women Conference live streamed from St.Pauls London in December 2012. Watch the recorded video archive from the conference here. This event was filmed & streamed live on behalf of the Thomson Reuters Foundation. We're streaming this one day education conference live from Hong Kong, on Wednesday 17 October. Watch the Dell Technology Camp 2012 - live video stream by Switch New Media. Watch the Eduserv Symposium - Big Data, Big Deal? live webcast from London. The Searchbrat SEO services workshop was recently filmed by Switch New Media. 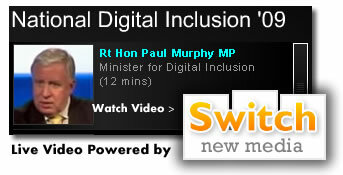 The UK's National Digital Inclusion Conference recently took place in Westminster, London. Nine Members of Parliament spoke at the event and Switch New Media live streamed the two day conference to over 5,000 viewers, from 50 countries. Watch archived footage from the G20 Summit in London » filmed on behalf of the G20 Voice campaign. • Live streaming from the "Next Big Thing" event in Belfast. The LivCom Awards were launched in 1997 and are endorsed by the United Nations Environment Programme. This annual awards conference takes place from 6th to 10th November. Over 50 countries are represented within the Awards. • Live Webcasting at the WiseKids Young People, Mobile and Internet Technologies 2008 Conference, Swansea. A conference supported by the Welsh Assembly Government & attended by over 200 delegates. A conference attended by over 120 delegates - streamed live to the web. "Festival of Ideas, Popular Culture and Progress"
"Undoubtedly one of the best live streaming events I’ve seen"
Providing a complete communications solution, we can broadcast your event or business live and to a global audience. Live Video Streaming, Webcasts or Webinars? Not sure where to start? Speak to a Live Streaming Specialist for more details.